Violent protests have been sparked by recent decisions by the Panamanian government to sell land in part of the duty-free Colon area of the Panama Canal. The protests were sparked by a new law that was passed, but then as pressure from the street mounted, it is now reported that the law is abandoned. Although it is being reported that the government recanted its decision due to pressure from the streets, it was too late for many victims. 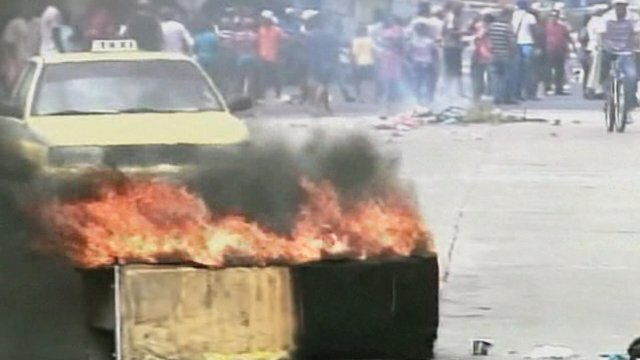 Clashes with police in the streets of the sea-port of Colon reportedly left 15 people wounded, 50 incarcerated, and 1 dead. The fatally-wounded victim, a nine year old boy, was shot once in the stomach. He died at the Manuel Amadador Guerrero Hospital. At least six other people were treated for gunshot wounds and several others for pellet wounds. The protests in Panama broke out last week immediately after the Panamanian government passed the law that was backed by President Ricardo Martinelli of the conservative Democratic Change Party. Martinelli had signed the law just hours after the National Assembly approved the legislation. After the massive outpouring against the law, the Panamanian government has now changed their decision. Currently, private companies have to lease land in the duty-free area of the Canal Zone. Whatever problems exist with the local leasing of land by the government, the neoliberal alternative of selling off the land is worse for the people. The law would have permitted the sale of land in the duty-free zone to private interests. Protesters stated that the law would have sold off their city to corporations. Conservative President Martinelli claimed in a TVN-2 television interview, that the neoliberal policies would benefit the province of Colon. He accused “agitators” and “small-minded interests” of opposing the law. The law would have split the revenue from the sales between the local and central government. While a percentage of sales revenue was supposed to benefit the people through “social investment,” the reality is that in the long-term the people would have lost out by losing the revenue gained through leasing the land. Rather than selling off the land, critics have said that the current leasing fees should be increased and used to help the poor. The reality is also that if the new law was implemented that corruption would have siphoned off much of the “social investment” to the politicians themselves as typically happens in neoliberal sell-offs of the public sector. The new policies would have adversely affected jobs and social services. Even though protesters have temporarily forced the administration to abandon its planned sell-off, once media attention dies down, they may try again. The imperialists have long sought to control Latin America. Panama became independent of Colombia only when the United States intervened in order to gain the rights to the Canal. The role of the United States in the region is a long and bloody one. The United States’ policy toward Panama has often been determined by the Canal. When the Panamanian masses have sought to renegotiate the conditions of the Canal Treaty or assert their rights, the United States has responded with threats, wars, assassinations, occupations, etc. The neoliberal policies that have swept Latin America in the past decades represents more imperialism. The neoliberals aim to sell off what remains of the Latin American public sector to corporations. However, this round in Panama goes to the masses. The masses were able to rise up to reverse the sell-off. They forced the administration to temporarily retract its law. Che Guevara once called the United States the belly of the beast, the center of capitalism-imperialism. The United States, its population as a whole, feeds off the suffering of other countries. The American way of life is paid for by the blood of others. Imperialism will continue to enslave the peoples of Panama, Latin America, and the Third World generally. The United States has long considered Latin America to be its backyard colony. When the people of Latin America rise up, the United States does what it can to crush them. There is a long history of genocide waged by the United States against the poor and indigenous peoples of Latin America. The Mexican revolutionary Zapata said that it is better to live on your feet than die on your knees. If we are to truly turn the tables, if we are to truly and defeat capitalism once and for all, righteous anger by itself is not enough. We need to apply the most advanced revolutionary science, Leading Light Communism, to the project of ending all oppression.